The popular and talented Claire Saxby has produced a magnificent picture book in verse format. 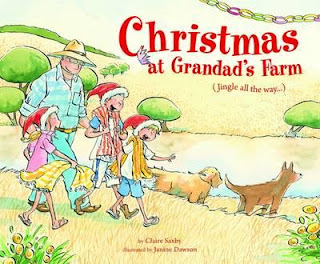 Christmas at Grandad’s Farm is a warm, fun-loving depiction of family unity and holiday enjoyment. Using the Jingle Bells theme, her own Christmas song depicts a typical Aussie family barbeque, and the freedom of outdoor fun and games; swimming in the creek, too much food, over-eating, and the company of family - young and old. Dust clouds, leaping kangaroos, tree-lined roads running besides farmhouses, travelling in an old ute through the countryside and our good old Aussie language all add flavour to the carefree scenes. Barbeques in the country are nothing without barking dogs, kids shouting, a game of cricket, clothes strewn everywhere, and that last wonderful event of the day when all the children are in bed. Then it’s all around the Christmas tree, presents, wrapping paper everywhere, hugs and kisses, sharing, and a house filled with love. Then it is home again in the old ute. Congratulations to Janine Dawson on the amazing translation of the text in watercolour and pen. She’s brought words to life with her insight and talent. This book is ideal for promoting Australian country life and would do well in all areas of tourism and promotion.